Many people have become concerned that chemicals in a number of commercially available cat foods may have adverse health consequences for their pets. However, when seeking alternatives, it is important to understand the nutritional needs of your cat. If you wish to implement a home-made natural diet for your cat, it is important that in addition to selecting foods that are free from hormones, chemicals and pesticides, you also ensure that the diet meets your catâ€™s particular nutritional requirements. Check with your veterinarian before implementing a home-made diet. Many veterinarians suggest raw food, but this carries the risk of infestation with parasites or bacterial contamination. All meats should either be cooked or frozen for at least a week and then thawed before feeding, and should be washed with clean water before you serve them to your cat. Wild game, pork, rabbit and any ground meats should always be cooked. Cats are natural carnivores and attempting to feed a cat a solely vegetarian diet will harm its health. Veterinarian Shawn Messonnier offers advice for ensuring that cats receive the nutrients they need from home-made diets, including asking your veterinarian to recommend a nutritional supplement. Supplements should be tailored to the specific medical and nutritional needs of your cat. Additional required nutrients such as calcium and phosphorus can be provided by adding bonemeal powder or tablets to a catâ€™s food. Omega-3 fatty acids can be added as flax seed oil or coldwater fish oil. A veterinarian-recommended multivitamin-and-mineral supplement and digestive enzymes should also be added. Additional antioxidants and phytonutrients can be included in the form of alfalfa, barley grass, spirulina and wheat grass. The following cat food recipe, which comes from Shawn Messonnierâ€™s book, The Natural Health Bible for Dogs & Cats, provides approximately 33% more calories than most kittens and adult indoor cats require each day, and about 10% more than that required by outdoor cats, though caloric needs will vary based on a catâ€™s weight and activity level. Messonnier notes that a small amount (1/2-1 cup) of slightly steamed or fresh raw vegetables such as broccoli or carrots (shredded or diced) can be added as a top dressing to improve nutritional value. 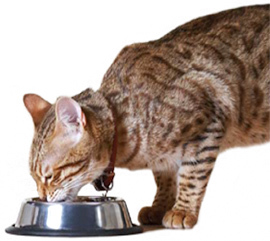 Feeding your cat a natural diet may reduce the risk of diseases of the bowel and intestinal tract. Natural diets are free from additives, preservatives, food stabilizers, wheat and other ingredients commonly found in tinned foods that can cause digestive problems in some cats. Anecdotal evidence suggests that cats consuming natural diets are often more active and have sleeker coats than those fed on regular commercial foods. However, there are a number of all-natural, organic, human-grade, holistic and hypoallergenic tinned cat foods commercially available for those who do not have the time to prepare daily meals for their cats.